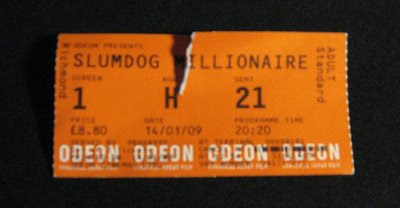 OK I'm going to try to share with you a few quick thoughts on the film Slumdog Millionaire without giving away the story for those of you who haven't seen it yet. What's it about? : The story of the life of an impoverished Indian teen Jamal Malik, who becomes a contestant on the Hindi version of "Who Wants to be A Millionaire?" This film has already won five of the six awards it was nominated for at the Critics Choice Awards and all four of the awards it was nominated for at the Golden Globes and is nominated for about a million others. Does Slumdog Millionaire deserve all these awards? Is the film really that good? Short answer is absolutely. I was completely captivated from beginning to end. Not only did the plot keep me intrigued (wow it's surprisingly hard to write about a film without giving away the details!) the combination of excellent cinematography and a well chosen soundtrack really brought the story to life. In one scene (you'll know the one I mean once you've watched it) I felt I could even smell the story! 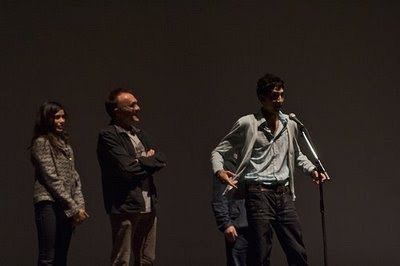 The director Danny Boyle has done a fantastic job and deserves all the awards he gets for this film but lets not forget the starring actor, Jamil Malik. Jamal Malik is played by Dev Patel, you might have already seen him in Skins. From what I can gather, Skins is basically the only other acting this guy has done. He's 19 years old and has just won the British Independent Film Award for "Most Promising Newcomer", National Board of Review of Motion Pictures Award (NBR Award) for "Best Breakthrough Performance", the Black Reel Awards for "Best Actor" and "Best Breakthrough Performance" and the Chicago Film Critics Association Award for "Most Promising Performer" in 2008. Not bad for his second acting job! I would strongly recommend you see this film, at the cinema if possible because it sounds and looks awesome. Perhaps don't expect the feel good ending that the press seems to be suggesting you'll walk away with, it's more of a content feeling that you've just seen a really good film. I'm giving it a 8.5/10 but it's very close to being a 9. Nice review. Can't wait to see it.